Digital Surrogates from the Facts for Freshmen records includes a digitized copy of the 1914 publication "Facts for Freshmen", published by the Dean of Men, Thomas A. Clark, containing suggestions on planning a program of study and descriptions of administrative procedures, organization of the University, regulations and student service. 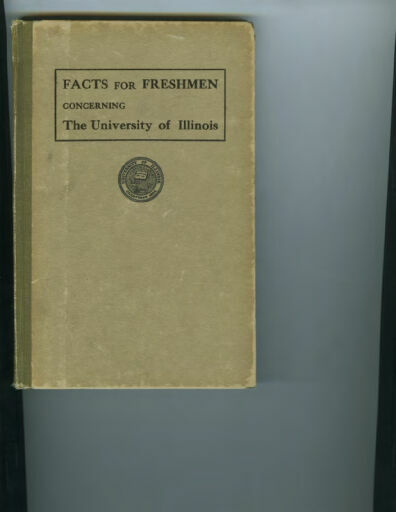 The Facts for Freshmen Records (Digital Surrogates) are managed by the University of Illinois Archives and do not feature precise descriptive information for each item. Discover their contents by browsing the folders and files. For more information, contact an archivist at illiarch@illinois.edu.